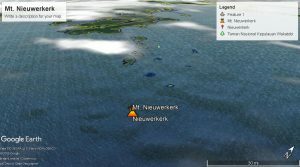 Mount Nieuwerkerk is a twin underwater volcano with peaks at each other lk. 7 km. Peak I and II are separated by a saddle with a depth of 600 m from Peak II.